The apartment is part of a very large and ancient house, in the centre of the mediaeval village of Montecastelli- Pisano. It has two double-bedrooms 'en filade' (connected), a big sitting and dining room, fully equipped kitchen and a bathroom. All the windows face South East, with fine views. The main internal feature is a very old, and rare, internal fireplace, around which up to 9 people would sit on benches keeping warm and chatting in the winter. Nowadays there is central heating! There is a child-friendly private, gated, walled garden only 25m from the house, with a vine- covered pergola, kaki and pear trees, and dining facilities. The village of Montecastelli was built in the 13th century between the Peacock Valley (Val di Pavone) and the Cecina Valley, on the top of a hill 504 mt high. Its characteristic houses made of local stones give it a particular atmosphere. The streets are two ellictic lines one above the other on the top of the hill. Montecastelli lies 2km from the Peacock River (Pavone) where it is possible to bath, to swim, to make long walks in a wonderful canyon until you reach the confluence with the Cecina River. The village of Montecastelli was built in the 13th century between the Peacock Valley (Val di Pavone) and the Cecina Valley, on the top of a hill 504 mt high. Its characteristic houses made of local stones give it a particular atmosphere. The streets are two ellictic lines one above the other on the top of the hill. Montecastelli nestles in the beautiful Peacock Valley (Val di Pavone), encircled by fine woodlands, hills and meadows. The valley is home to a wide variety of animals, birds, butterflies and rare wild plants: snowdrops, hellebore, anemone, narcissus, cyclamen, wild orchids, primrose, brooms, wild cherry trees and arbutus unedo to name just a few. Montecastelli lies 2km from the Peacock River (Pavone) where it is possible to bath, to swim, to make long walks in a wonderful canyon until you reach the confluence with the Cecina River. In case of health problems an English speaking family doctor is nearby. 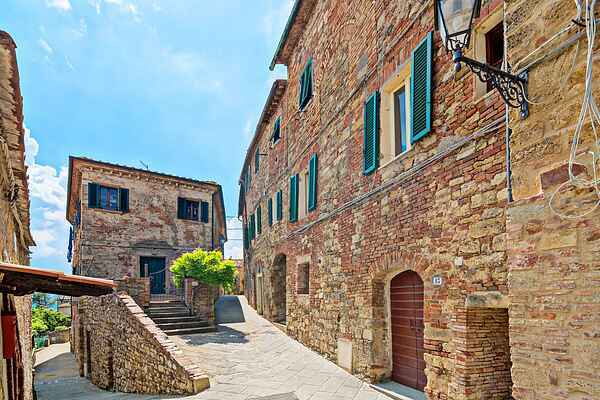 The apartment is part of a very large and ancient house, in the centre of the mediaeval village of Montecastelli- Pisano. It has two double-bedrooms 'en filade' (connected), a big sitting and dining room, fully equipped kitchen and a bathroom. All the windows face South East, with fine views. The main internal feature is a very old, and rare, internal fireplace, around which up to 9 people would sit on benches keeping warm and chatting in the winter. Nowadays there is central heating! There is a child-friendly private, gated, walled garden only 25m from the house, with a vine- covered pergola, kaki and pear trees, and dining facilities.